Shout’Em is a microblogging platform that allows users to create their own twitter clones in a matter of minutes. Creating twitter clone to compete with twitter doesn’t work, but you can create microblogging communities for your company or community or for your close friends. ShoutEm allows complete customization of the community you create. You can set different styles, or use your own css, header design, you can customize almost anything. When you create a network you can choose a URL for your network, it comes as a subdomain to shoutem.com. For example check out the network i created to test the service at teknobites.shoutem.com. If you prefer to use your own URL you can do that by changing the CNAME records of your domain. ShoutEm offers a set of features like text, link, photo, location etc. It is compatible with Twitter API, that means any twitter compatible application will work with your network. Offers RSS feeds to get updates. You can make your network provate if you prefer that way. ShoutEm networks are free to use, they make money by displaying ads alongside the networks. I guess ultimately they will offer subscription packages for users who wants to build serious communities on shoutem. 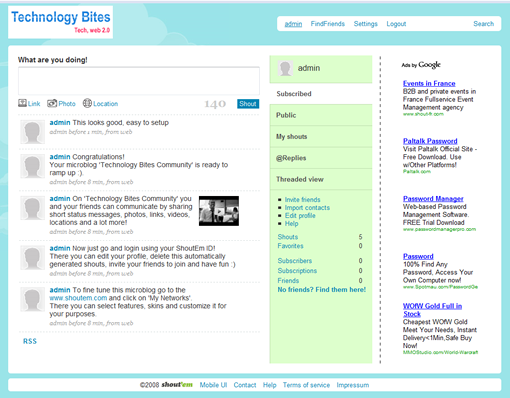 Give shoutem a try if you want to have your own microblogging community for your employees or for your friends. ShoutEm is currently in beta, enter “doneright” as invitation code to get access. Wow, great app. Taking blogging to another level. SO I guess it’s also wap 2.0 compatible as usually microblogs are mostly updated from ones mobile phone.